Liz Brown climbs aboard a cart to try her hand at driving. As a lifelong rider, I didn’t think I’d have any hesitation about trying out driving. I’d been a passenger on a carriage ride in Varadero, Cuba, and I’d taken the odd sleigh ride at Christmas markets, but as I climbed aboard a two-seater cart pulled by a little Welsh pony, I felt strangely unsettled. “You look nervous,” Jane Southgate joked as I gripped the bar attached to the seat and we set off at a walk down the driveway of her farm in Glen Morris, Ontario. I took a deep breath and made a conscious effort to look more relaxed, trying to figure out why I felt so tense to be behind a horse, but I was entirely comfortable being astride one. I’d come to see Jane, a friend and fellow rider, because she was also involved in the driving world – a world I knew nothing about and wanted an introduction to. Jane is a lifelong rider who didn’t seriously take to driving until about 15 years ago. “There are some pictures of me getting stuck in the snow in the cutter with my pony,” she joked of an early failed attempt at driving the hunter pony she showed as a teenager. 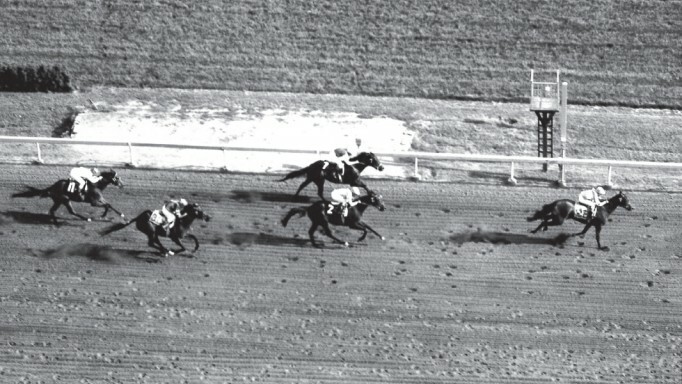 Jane’s mother and grandmother were both avid drivers who showed hackney ponies, but she didn’t get the bug until her husband, Bob Hanenberg, who was involved in Standardbreds, found a Standardbred pony that needed a home. It was with this pony that Jane had her first taste of competitive driving and became more deeply involved in the world. “When I switched to driving, it was easy to do because of my riding background,” she said. As I soon found out, riding skills and knowledge come in handy when attempting driving for the first time, but it didn’t help with the fear I felt in the cart. I think it was the odd feeling of being ‘disconnected’ from the horse when I was so used to having a number of aids at my disposal (my seat, legs, shifts in weight) and being forced to adapt to using only my hands and voice. For my first crack in the cart, Jane took me out with her Section A Welsh pony Napoleon (a.k.a. Stonecroft Disco), who her husband competes in pleasure driving classes. I took another deep breath, relaxed my hands and began to enjoy the ride as Jane urged Napoleon into a trot in her grassy driving area, where she had cones set up to practice turns. As Jane navigated Napoleon around the obstacles, she told me more about the driving world. She explained, like in riding, there are a myriad of competitions people can attend. There are reinsmanship classes that follow a pattern, in which the ability and skill of the driver is judged. 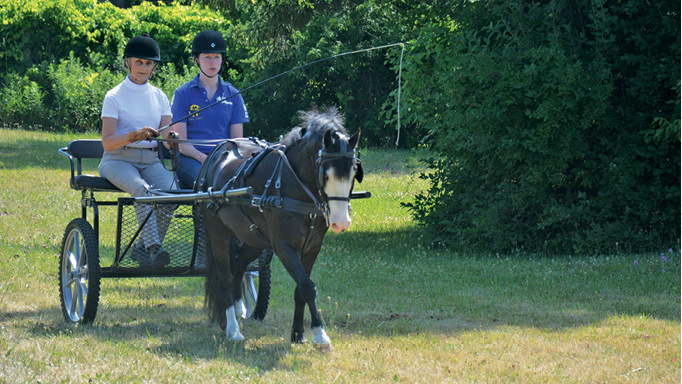 There is also pleasure driving, where the classes are judged more on the horse’s manners, performance and conformation. 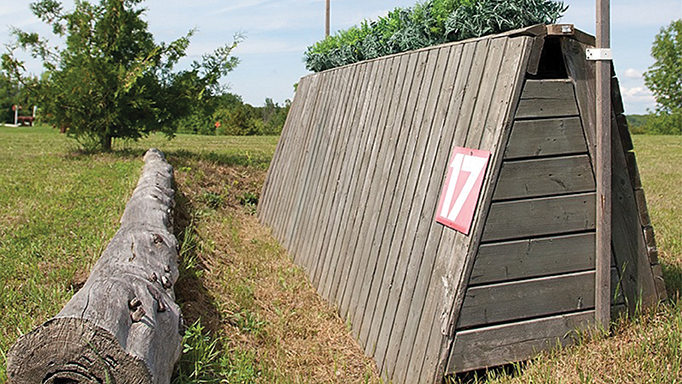 Then there is combined driving – the three-day eventing of driving – where horse and driver are tested for their versatility. In the combined classes, the team must do a form of driving dressage (in a 40 metre x 80 metre dressage ring), marathon (where the horse is driven through natural obstacles like water and tight turns around trees), and obstacle cone driving (similar to stadium jumping, but the horse is driven through and around cones). Additionally, there are breed classes, turnout classes (where the appearance of carriage, harness, horse and driver are judged) and ride & drive classes. Like in riding, many people don’t show at all and just participate recreationally to enjoy some time outdoors with nature and their horses. “It’s really nice coming out here, driving your pony after a long day at work,” Jane said. As Jane navigated Napoleon handily around cones at the trot, I became more and more relaxed and even cracked a smile. Once I got over the strange sensation of being behind the horse, things seemed okay and even pleasant. Finally, it was my turn to take the reins. Jane and I switched seats (like driving a car in the U.K., the ‘driver’ sits on the right-hand side and the passenger sits on the left). The reins are held differently from riding – in the left hand your rein goes over your index finger and is held down by your thumb. In the right hand the rein goes between your middle and fourth finger. The whip is held in your right hand at a 10 o’clock angle. “I use their name because when you’re in a class, everyone will be saying ‘walk’ or ‘trot’ so I don’t want them to be confused and listen to other commands,” she noted. If the pony doesn’t react to the voice command, she lightly touches them with the whip to get them to move forward. 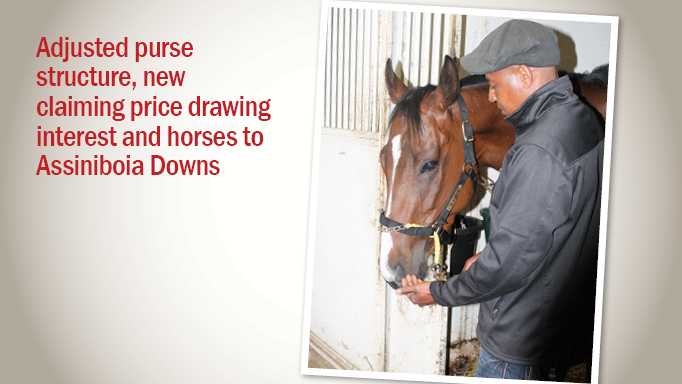 The whip is also used like in dressage – as an aid to ask a horse to collect and engage their hindquarters more. Steering and turning is much the same as riding, with your outside rein being the ‘balancing’ and ‘steering’ rein and the inside rein used for bend. I walked Napoleon around, but wasn’t holding the reins in as natural a position as Jane had. When I asked Napoleon to trot, I instinctively flicked my heel, like I would do while asking a horse I was riding to trot. (Spoiler: Flicking your heel does not make your driving pony trot any better). Trotting was a little trickier, and I realized that I had to hold much more contact with the reins than I would while riding. Without my seat or weight to rely on, I had only my reins for half halts and control. At the trot, Jane had me navigate Napoleon between a few cones, warning me not to “look down” at the cones as I passed through. In this sense, obstacles are like jumping, where you must look ahead to where you are going and anticipate your next moves. After about 10 minutes, my arms felt tired so I switched seats and handed the reins back to Jane, feeling much more comfortable in the cart than I had when we started. Jane told me that anyone interested in driving should find an experienced driver to mentor them, but noted there is a dearth of people who provide lessons in driving. She recommends starting with local associations that sometimes offer clinics for people interested in the discipline. Jane is a member of the Tri-County Carriage Association, which offers clinics for people who want to learn about the sport. Just this spring, Jane took Napoleon to a Tri-County junior clinic where young people were given the opportunity to try driving and was surprised with the turnout – 19 juniors showed up. For the beginner, Jane recommends finding a seasoned driving horse. There are plenty of breeds and styles to choose from depending on your preference – from the big drafts to lighter horses like Morgans, all the way down to small ponies like Napoleon. “Keep in mind that the larger the horse, the more people you can take with you when you drive,” she said. For a pony Napoleon’s size, he can really only pull two light people. Driving, like riding, can be an expensive hobby. But also like riding, there are different levels of what you need to spend and the beginner driver doesn’t need the most expensive equipment. Jane estimates you can get a work harness and cart for a pony for $2,000 and a dependable pony that’s trained to drive for less than $5,000. From there, the sky is the limit. If you want to show, drivers need clean, presentable pants, a hat, a jacket, gloves and an apron (traditionally an apron was worn by people who traveled by horse and buggy so as not to get road dust on their clothes). Driving has many parallels to riding and I felt increasingly comfortable behind Napoleon as we navigated the obstacles outside. I was considerably less sore than when I ride, and it was also less of a workout. Jane noted that driving attracts a lot of riders who are looking for an activity with horses that’s slightly easier on the body than riding. For now, I think I’ll stick to sitting on a horse, but I have to say the combined driving with the marathon event certainly piqued my interest. Assiniboia Downs will have a new and dynamic element to its live racing this year.